The Bhagavad Gita: The Song of God Retold in Simplified English is the latest title in the Essential Wisdom Library. This unique edition of the timeless epic is designed to be accessible for readers without any prior experience of Hinduism. Not simply a translation of the original, Viljoen has simplified and restated the Gita’s complex ideas, so that a first-time reader can fully appreciate the scope and beauty of this magnificent Indian classic. Written in concise, modern language the retelling vividly captures the power and depth of the original work. Part of the Mahabharata, the Gita is a dialogue between Prince Arjuna and Lord Krishna. Its verses contain some of the key ideas of Hindu philosophy—Dharma, Moksha, and various yogic practices. Originally written well over a thousand years ago, the Gita has proven to be a timeless source of wisdom, inspiring philosophers and revolutionaries alike in the millennia since it was written. In addition to the retelling of the text, this edition includes a character list, a glossary of important terms, and chapters exploring the back-story from the Mahabharata and the impact and meaning of the Bhagavad Gita itself. The Bhagavad Gita is an approachable way for today’s readers to engage with one of history's richest spiritual epics. "Before reading The Bhagavad Gita: The Song of God Retold in Simplified English, my understanding of The Bhagavad Gita was basic, at best. This was the perfect book for me! Edward Viljoen led me through an overview of this sacred text with grace, clarity, and deep wisdom. My future studies of the Gita will be informed and enhanced by this marvelous book." "For those who want to look into the wonderful history of The Bhagavad Gita, one of the essential classics of Hinduism, Edward Viljoen has given the reader a perfect entry. Viljoen has readily explained his intentions and methods to us so that we may enjoy the cast of characters and realize, in beautiful but simple writing, the wisdom of this tome in approachable terms that are a pleasure to experience. Within a few pages the reader will find him or herself on intimate terms with Prince Arjuna, Lord Krishna and the other moving characters in what might otherwise be a daunting, devotional work. Simply put, The Gita is a journey of self-discovery, and Viljoen's clarifying prose helps to make this apparent. By all means, enjoy the journey!" "The Bhagavad-Gita can be daunting to even the most avid scholar, which is unfortunate since it is one of the richest, most essential works in the canon of religious literature. Edward Viljoen's retelling of this Hindu scripture in The Bhagavad-Gita: The Song of God Retold in Simplified English is the best way for beginners to understand the sacred text. Searing in its clarity, this book reveals the classic beauty and power of the Bhagavad-Gita." "Like many spiritual seekers today, I left my traditional Western religion behind and went in search of new inspiration. But without a working knowledge of Eastern philosophies and traditions, I found myself lost in a maze of sacred scriptures that I couldn't understand. And then I read Dr. Viljoen’s' clear and simple book on the Bhagavad-Gita and it opened mind to a magnificent new world of truth and beauty. Read this book slowly and savor every chapter." "With The Bhagavad Gita: The Song of God Retold in Simplified English, Edward Viljoen provides access to this profound sacred text in the comfort of modern English. It is my sincere hope that this invites many more people to explore the Gita and be inspired. Our complex modern world is navigated more wisely by those who study ancient wisdom. Edward Viljoen has invited many more of us into that wisdom with his beautiful rendition of this text." "Intricate ideas of devotion and surrender are made accessible through the discerning voice of author, Dr. Edward Viljoen; whose breath of knowledge on the topic of The Bhagavad Gita as part of the larger epic of The Mahabharata allows for a distilled yet satisfying sample for those who are thirsty for a spiritual drink. Join him as he takes us through a point of view deconstruction in his retelling of a complex grand battle that turns into an introspective spiritual self-analysis in ancient India. Common threads that unit major religions become apparent and lead the reader to evaluate their relationship with the Divine." "I knew little about The Bhagavad Gita. If you’re a truth seeker, Dr. Viljoen’s new book is a brilliant primer. Immensely readable and engaging, it opened my eyes to not only the richness and wisdom of Krishna, but also to the value of expanding one’s worldview. A liberating read. The truth does indeed set us free." "Viljoen’s masterful retelling of The Bhagavad Gita has left a smile on my soul and a skip in my step. Through the genius of his perspective, Viljoen manages to make this epic compelling to read and easy to digest. I actually feel like I was witness to the story as it unfolded before me, and its many lessons are as valuable today as they were some 2,300 years ago. Five stars!" "Edward has brilliantly brought these ancient, sacred writings alive today, even for the reader unfamiliar with Hinduism. His careful scholarship, combined with great passion for the relevance of the underlying story for modern times, has created an exciting and accessible masterpiece for the Western world. It is time we discovered the reasons for its endurance after over a thousand years and the great respect and worship it continues to inspire in the East. Edward’s writing is erudite and praiseworthy, while extremely approachable and understandable. He not only explains complex concepts with clarity and apparent ease but defines Sanskrit words and describes each of the characters in the story, even providing a map of the two supposedly warring families and their history. I have read and studied the Gita, the Upanishads, and other prized sacred scriptures in an academic setting, but never have I experienced the enthusiasm, the inspiration, and the lucidity that Edward brings to this scholarly yet welcoming and “user-friendly” work. The universal truths within the Gita have now become accessible for our personal application and use, and we are truly inspired to pick it up and read it again, or for the very first time, armed with new knowledge and understanding which, of course, leads us to greater wisdom. As Edward states in this work, it opens up for us, “A whole world of wonder and revelation.” I highly recommend we establish a permanent place on our bookshelf for this latest addition to his Essential Wisdom Library, right next to Eknath Easwaren’s translation of The Bhagavad Gita and encourage others to delve more deeply into this illumined writing." "I am delighted to have had the opportunity to read Edward Viljoen’s latest inspired writing! He has pulled the curtains back and shed light on The Bhagavad Gita in a way that has made it accessible and available to me or any other person who wishes to understand and digest the beauty and potency of this ancient scripture. I especially appreciate the stepping stones Edward provides to support the uninitiated student in developing a grasp of all the Gita reflects. From a simple explanation of the relationship between the Upanishads, Vedas and Gita, to family trees, a cast of characters, glossary of many Sanskrit terms and insights into the Hindu spiritual tradition, the reader is well equipped with context and background information. Also, his narrative of “re-telling” feels spiritually rich and sacred to me. I feel wisely guided into a new appreciation of The Bhagavad Gita and know other students of spiritual wisdom will also be well served by all this book offers." "Rich in background, deep in insight and accessible to the mind and heart, this book offers welcome guidance for living through confusing and disturbing times: show up on the battlefield of daily life, do what is naturally yours to do, and offer each action as a service to the Divine. Thank you, Krishna. Thank you, Arjuna. Thank you, Dr. Edward." 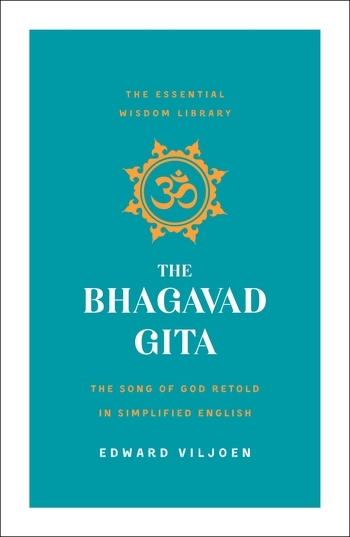 "The Bhagavad Gita: The Song of God Retold in Simplified English is an easy to read and understand version of the beloved “Bhagavad Gita.” The original text is in Hindu, and even translated to current day English can be quite challenging to read. This version of the Bhagavad Gita uses paraphrase so the language is much easier to understand and the messages taught are much easier to appreciate. After reading this “simplified” version, I’m much more willing to dive more deeply into more complex versions of the Bhagavad Gita. After the Bhagavad Gita itself is paraphrased, the author includes sections with information on the Mahabharata, an ancient Indian epic poem which contains the Bhagavad Gita, and a family tree of the families involved in the Bhagavad Gita. There is also a thought-provoking chapter on The Path of Devotion that discusses Bhakti Yoga – discussing “a love, or devotion focused spiritual path to freedom in service to a personal form of God.” Edward examines the similarities between the beliefs as outlined in the Bhagavad Gita, with Christian beliefs as expressed and taught by Jesus with Love being the center theme of both. Viljoen concludes the book with a chapter entitled Hindu Spiritual World View, a comprehensive look at Hinduism today. I would highly recommend this book to any beginner interested in learning about the beautiful lessons in the Bhagavad Gita, or for those who have some knowledge of the text but want an easy-to-read version that highlights the beauty of the lessons." Dr. Edward Viljoen graduated as a Sonoma County Law Enforcement Chaplain in April 1999, and received a Doctor of Divinity and a Doctor of Religious Science from Centers for Spiritual Living. He was awarded the much-respected Ernest Holmes Award for exemplary demonstration of the teachings of Dr. Ernest Holmes. He is the spiritual director of the Santa Rosa Center for Spiritual Living, in Santa Rosa, CA.